For a good while, DigiTech was a name you would turn to when you needed to layers some quality effects over your guitar’s signal. That hasn’t changed much although this brand definitely doesn’t have the same hold over the market any more. With that said, they have one of the most popular phaser pedals on the market in their line-up at the moment. It’s not too original in terms of design and features it offers, but it’s definitely among the best you can get at the moment without having to drop large amounts of money. Aside from some gimmicky features such as the glow in the dark logo, DigiTech SP-7 Hardwire brings heavy hitting performance in areas which matter the most. When you look at the layout of the controls, it looks eerily similar to a certain Boss phaser, but why fix something if it ain’t broken, right? The innards reveal a much more unique nature. Everything on this pedal is hand wired while it also comes with true analog bypass. Tap tempo feature is present and is among the more practical ones in the whole package. The controls will be pretty familiar to anyone who’s been using Boss phasers in the past. There are four knobs to work with – Speed, Depth, Modify and Stage Select. The first three are your standard stuff. They allow you to adjust the frequency of the effect, the depth of the phaser effect and the resonance. That last knob is where this pedal steps away from the famous green Boss unit. 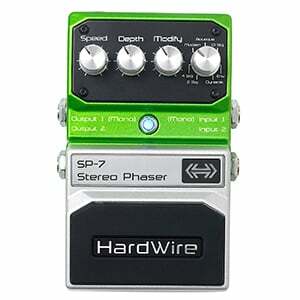 The stage selector on DigiTech SP-7 Hardwire is a bit more versatile and comes with several niche settings. Put head to head, SP-7 takes the lead in this regard over Boss. It just feels a bit more refined and round around the edges. What this pedal does the best is delivering clinically precise phaser effect that is on the level of boutique phasers in terms of quality. Using the existing controls, you can dial in a wide range of phaser types with a lot of maneuvering space for fine tuning. Tap tempo works as advertised, and it definitely makes the whole package that much more practical for frequent use. Different available stages are very well thought out, including a lot more than just 2/4/8 stage phaser like most pedals do these days. The combination of components, features and performance of DigiTech SP-7 Hardwire make it one of the best phasers available. With that said, this bad boy isn’t the cheapest one by any account. However, it delivers a pretty boutique experience for a price that isn’t quite in that territory. In other words, it’s a bargain for the most part. Especially considering the way it was built and how the effect sounds. It doesn’t sound artificial or cold as some modern phasers do, and that’s a rarity at the moment. At the end of the day, this is one phaser pedal you can turn to if you’re new to the effect and you want a proven one that just works. For more info about the DigiTech SP-7, click here.